Touch the Connections tab and choose Wi-Fi. Don’t touch the master control icon, which turns the Wi-Fi radio on or off; touch the Wi-Fi text on the left side of the screen. You see a list of Wi-Fi networks displayed. Any previously connected networks that are not in range appear at the bottom of the list. In the example, the Imperial Wambooli network is now connected. Choose a wireless network from the list. When no wireless networks are shown, you’re sort of out of luck regarding Wi-Fi access from your current location. 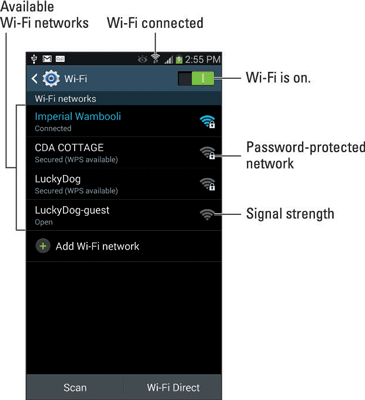 In the example, the phone user chose the Imperial Wambooli network. If prompted, type the network password. Putting a check mark in the box by the Show Password option makes it easier to type a long, complex network password. You should be immediately connected to the network. If not, try the password again. When the phone is connected, you see the Wi-Fi status icon appear atop the touchscreen, as shown in the margin. This icon indicates that the phone’s Wi-Fi is on, connected, and communicating with a Wi-Fi network. Some wireless networks don’t broadcast their names, which adds security but also makes accessing them more difficult. In these cases, choose the Add Wi-Fi Network command to manually add the network. You need to input the network name, or SSID, and the type of security. You also need the password, if one is used. You can obtain this information from the unfocused young lady with the lip ring who sold you coffee or from whoever is in charge of the wireless network at your location. Not every wireless network has a password. They should! Some public networks are open to anyone, but you have to use the Internet app to get on the web and find a login page that lets you access the network: Simply browse to any page on the Internet, and the login page shows up. The phone automatically remembers any Wi-Fi network it’s connected to and its network password. The network is automatically connected as soon as the Galaxy Note is within range. To disconnect from a Wi-Fi network, simply turn off Wi-Fi on the phone..
Use Wi-Fi whenever you plan to remain in one location for a while. Unlike a mobile data network, a Wi-Fi network’s broadcast signal has a limited range. If you wander too far away, your phone loses the signal and is disconnected.